The Sound of Music remains a tourism anchor, but there's much more going on here. ... and a room at Hotel Sacher Salzburg. 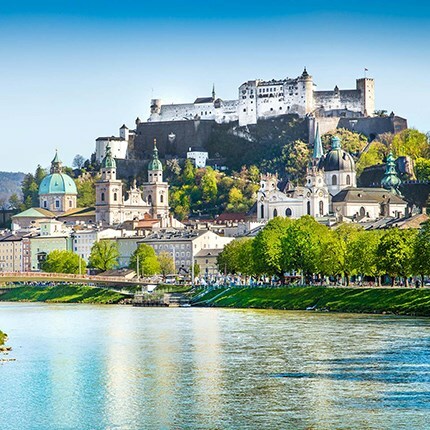 GO FOR: Salzburg is turning heads this year, thanks in part to the 50th anniversary of The Sound of Music, which was filmed around the city. Even Kaiser Karl (Lagerfeld, that is) was taken by the edelweiss obsession, creating an Alpine-inspired Chanel Métiers d’Art pre-fall collection, unveiled at the Leopoldskron Palace last December. Soak up Salzburg’s charm on a stroll past baroque church spires, elaborate fountains, and spacious squares. Autumn brings cool temperatures, a solid classical concert lineup, and a Sound of Music gala on October 17. EAT: Before his show, Lagerfeld dined at St Peter Stiftskeller (St. Peter Bezirk 1/4; 43-662/841-2680), one of Europe’s oldest restaurants, where guests feast on dishes such as duck breast and basil dumpling cream soup. Enjoy hilltop views and an Austrian- and Mediterranean-influenced menu at m32 (Mönchsberg 32; 43-662/841-000) in Salzburg’s sleek Museum der Moderne. For no-fuss Austrian fare, get your schnitzel fix at Goldene Kugel (Judengasse 3; 43-662/265-3820). DRINK: Mozart, who was born in Salzburg in 1756, favored a coffeehouse now known as Café Tomaselli (Alter Markt 9; 43-662/844-4880), where waitresses in frilly aprons deliver doily-covered trays of sweets. Come happy hour, head to Bräustübl Tavern (Lindhofstrasse 7; 43-662/431-246) for a mug of Märzen beer. Monks have been brewing the Salzburger ale at the adjacent Augustiner Brewery since 1621. 845-457), which offers an edgier take on the traditional dress. Beneath the gleaming guild signs of Getreidegasse, Salzburg’s busiest shopping street, lies Café Konditorei Fürst (Getreidegasse 47; 43-662/843-621), the place to buy Salzburger Mozartkugel – foil-wrapped marzipan, nougat, and dark chocolate candies – by the handful. STAY: Last year, 30 rooms and suites at the 113-room Hotel Sacher Salzburg received a facelift, complete with high-tech marble bathrooms with televisions in the mirrors. Doubles from $280, including breakfast daily and a one-way private airport transfer. Hotel Goldener Hirsch welcomes guests in 70 authentic Austrian-style rooms and suites, plus cozy, wood-paneled public spaces. Doubles from $776, including breakfast daily and a lunch or dinner for two. 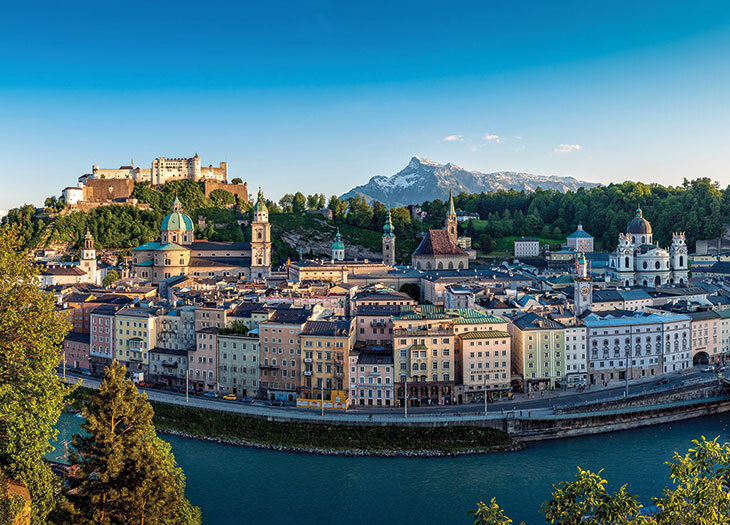 Virtuoso travel advisors can tap Virtuoso’s on-site connection in Austria to secure tickets to the Sound of Music gala or arrange a private, von Trapp-approved tour of the film’s iconic sites. If you'd be interested in collaborating with a Virtuoso travel advisor on your next trip(s) – Austria or otherwise – click below to connect. Virtuoso travelers approach the idea of working with an advisor from a variety of backgrounds – and many had initial concerns that you might have. Look over some real stories and see what resonates with you.